The earliest predators appeared on Earth 480 million years ago – and they even had teeth which were capable of repairing themselves. A team of palaeontologists led by Bryan Shirley and Madleen Grohganz from the Chair for Palaeoenviromental Research at Friedrich-Alexander-Universität Erlangen-Nürnberg (FAU) have been able to discover more about how these organisms were able to grow and regenerate their teeth. In a land before time: A fast-moving predator with sharp teeth goes hunting in the prehistoric sea. It spies some prey and advances stealthily. All of a sudden, it goes in for the kill and devours its prey. Some of the predator’s teeth have broken, but they will grow back. This is not the description of some prehistoric monster from a horror film, but rather of a conodont. Although these eel-like vertebrates were only a few centimetres long, they are considered the Earth’s very first predators. Their small teeth, which are known as elements and are among the most important microfossils, could repair themselves after being damaged. How exactly this happened is difficult to ascertain, as although the fossilised teeth are often found in marine rock, their soft tissue is only rarely preserved. Since only a few examples of soft tissue from conodonts have survived, it is very difficult to determine how they grew. Analyses carried out by FAU researchers are now shedding more light on the subject. By using scanning electron microscopes, the scientists examined the various layers of conodonts’ teeth to learn more about how they grew. During this process, a material is bombarded with electrons. Different materials reflect a different number of electrons back to the microscope. For example, heavy elements reflect electrons more strongly than lighter ones, which is why they are shown in a lighter colour on the image. This method enabled the individual layers to be reproduced and investigated at a much higher resolution than before. By using X-ray spectroscopy where elements are detected by means of the the radiation they emit, the scientists were also able to analyse the chemical composition of each layer. The teeth grew in cycles, which is shown in the alternating cycle between wear and growth of new layers. Furthermore, the shape of the teeth varied greatly depending on the animals’ stage of growth. Using the chemical composition and the shape of the teeth, the researchers were able to identify three stages of growth during the development of an animal that were influenced (amongst others) by feeding habits. After the first stage, a type of larval state, in which food was not digested mechanically (by chewing), conodonts evolved into the first hunters during the second and third stages of growth. 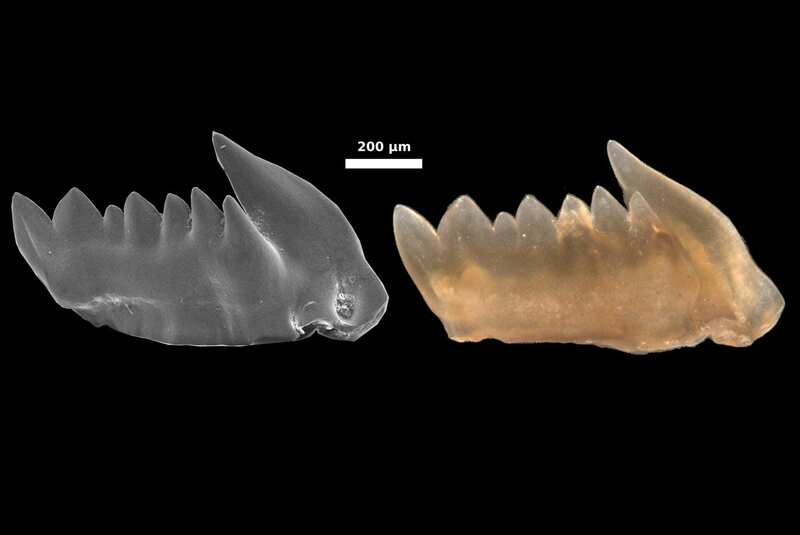 During this time, their teeth underwent a metamorphosis – the transition to being predators. Up to now, there have been two models to explain how conodont teeth were able to regenerate themselves. In contrast to human teeth, for example, that grow from the inside out, conodonts’ teeth repaired themselves from the outside where new layers were continuously added. One theory put forward by scientists is that conodonts retracted their teeth during periods of rest and growth occurred by the apposition of new layers in epidermal pockets. This could be compared to the mechanism of retractable teeth used for injecting venom by some species of snake. On the other hand, a theory exists that the teeth were permanently enveloped by tissue and a type of horn cap, allowing new layers to build up over time. The research carried out by FAU scientists has now confirmed the first theory. The results of the research have been published under the title ‘Wear, tear and systematic repair: testing models of growth dynamics in conodonts with high-resolution imaging’ in the journal Proceedings of the Royal Society B.